Prague to Munich – Czech Please! After almost a week of fun and frivolity in Prague, it was time to say goodbye. Chris and I made the relatively quick (and thankfully) downhill path to the train station. 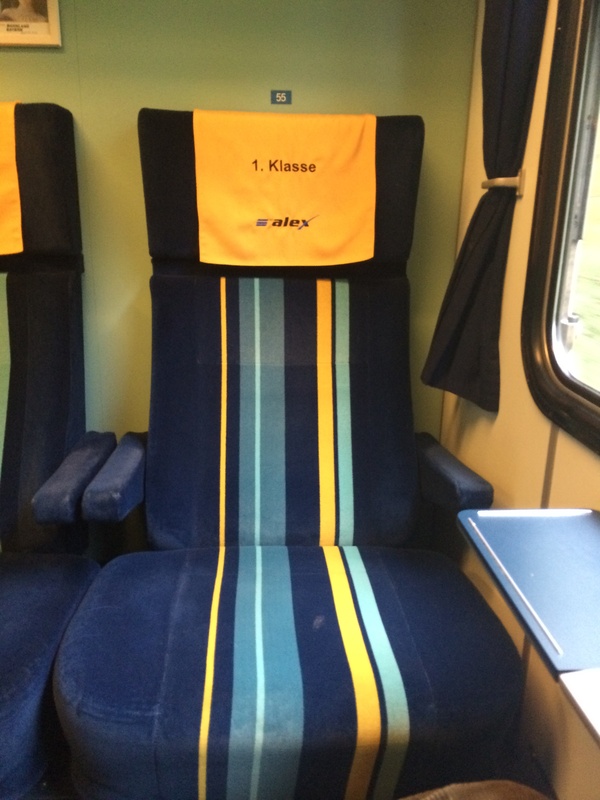 The train to Munich would be just over 6 hours and presented my first time in a European train car in 22 years. I was looking forward to seeing all of things that changed since then. Unfortunately, as we boarded, it appeared that our train probably hadn’t been updated in least that many years, if not more. WiFi? Uh no, there wasn’t even an outlet, except, quaintly enough, in the bathroom, which had a picture of an ancient looking electric razor by the outlet. First class, eh not so much. Slightly more problematic for my shall we say less than ample posterior was the seat, which clearly had seen better days. The cushions had essentially lost all of their comfort and were hard as a rock. There was some lumbar support, which was a saving grace but I knew it would be a long ride. Since we were in first class though, the car was relatively empty, and Chris and I actually were able to have respective rooms to ourselves. It was pretty grey out so the country side vistas were somewhat limited. Overall, hardly the romantic riding the rails experience. We arrived in the main Munich train station about 15 minutes late (so much for German precision) and made the short trip to our digs for the next few days. I had arranged for us to meet up with Catherine, one of my first cousins twice removed, who had been living in Munich for the past five years. She told us to take a tram, where she would meet us and then walk to the restaurant. The tram was very similar to those in Prague and quickly got us to our destination. Catherine welcomed and guided us to the metro for the next leg of the trip. The metro car was one of the most impressive I had ever seen – brand new and extra wide for a ton of room. We walked up to the street level and headed to the Spatenhaus Restaurant. Officially affiliated with the great Spaten Brewery, the restaurant represented a slightly more upscale version of a typical Bavarian brew pub. First up, of course, was a round of beers. I chose the Spaten dark ale and was thrilled to finally have a beer with taste again. Sorry Czech brewers but 4% ABV just doesn’t cut it for me. 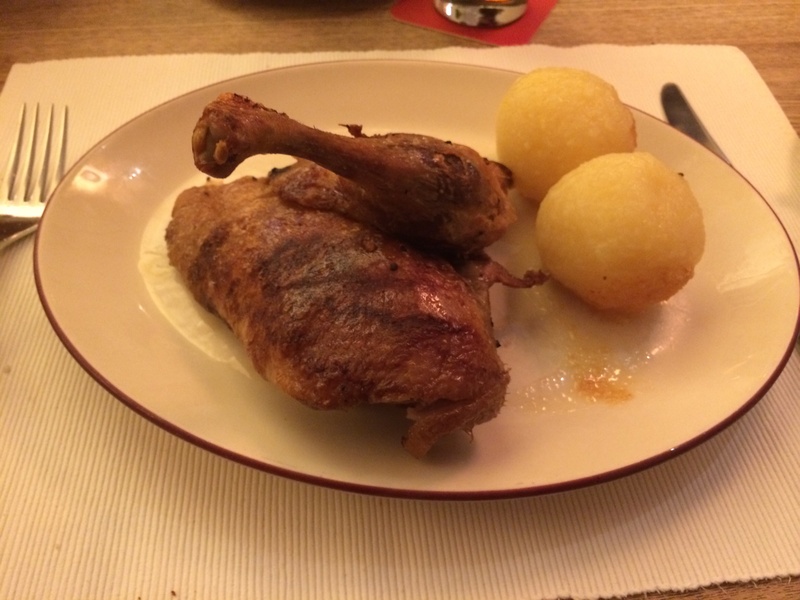 Catherine said the roasted duck was a specialty so I ordered that. In the meantime, I was delighted to find a basket of soft pretzels at the ready and happily munched on one to stave off my increasing hunger. While delicious, I was somewhat bummed the pretzels weren’t warm. 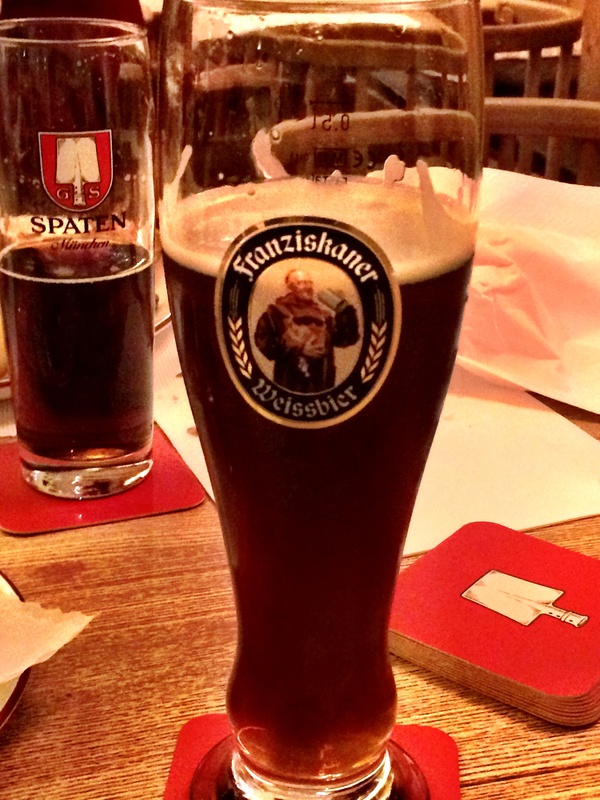 I had finished my first beer so for my next one, I selected the dark wheat beer, which packed a wallop at 12% ABV. Full beyond recognition, we politely declined Catherine’s offer of another beer and headed back to the main square. Catherine walked with us and provided some great historical facts along the way. It was interesting to see the difference between Prague, which come through World War II relatively unscathed, and Munich, which was essentially leveled. The biggest difference being the number of modern buildings and shops lining the streets, and the decided lack of cobblestone. We said our goodbyes and since it was a nice night, Chris and I decided to just walk back to the apartment, taking in the city in the dark. Tomorrow would be a full day so rest was in order, and thanks to the duck and beer, sleep came quite easily for me.